Check out Villas Chocolat’s brand new updates on their blog. 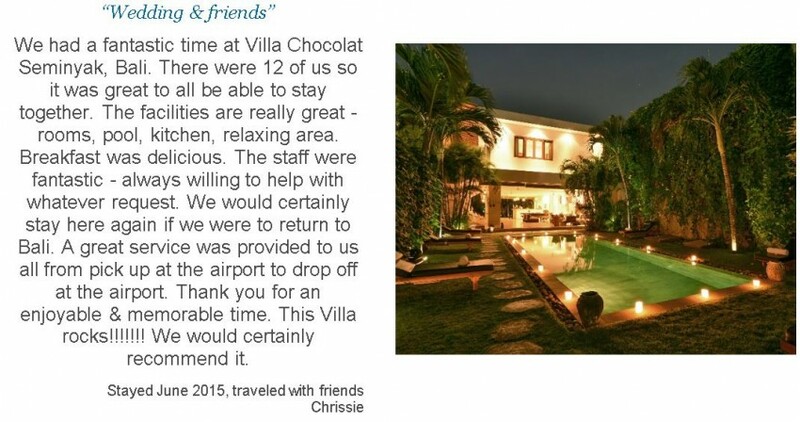 Villas Chocolat Bali, the guests’ feedbacks and more! After years of experience in Bali, the Villas Chocolat allowed hundreds of demanding tourists to live the luxury Balinese dreams. Because their feedbacks mean a lot to us, we want to thank all of them by publishing their wonderful comments. 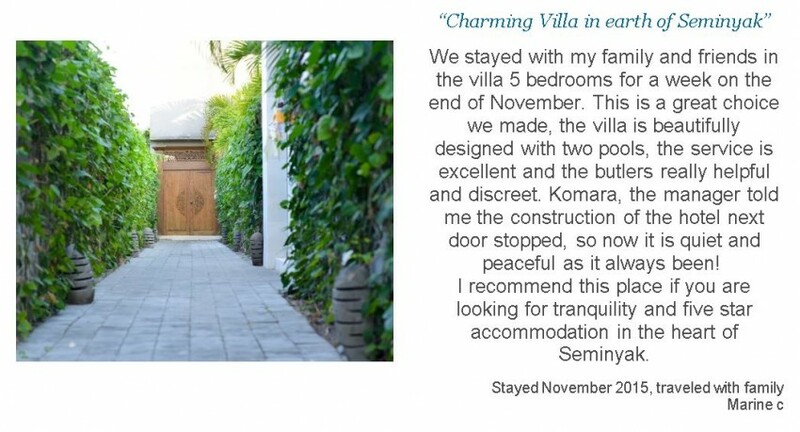 On the blog, you will discover how they enjoyed their stay in the 2, 5, 6 or 8 bedroom villa. And it’s not all we propose you: in this blog, you will also have the chance to read articles about the countless activities available in the island of Gods and you will see the new promotions we offer. So before leaving Villas Chocolat’s website, why don’t you take the time to read our brand new blog? Let us know what you think in the comments, we would be pleased to hear from you. We are glad Oldlorrie enjoyed his stay in our Villa Chocolat two bedrooms with his wife et his friends. Especially, we are delighted to watch our dearest guest enjoying their stay with us. Sandrine, Making you love your stay in our villa is the only task of our teams. Thus we are more than happy to have accomplished our mission, and we really hope to see you again. Anyway, thank you very much for your comment on TripAdvisor ! Most people travelling all around the world are only thinking about booking in some hotels. It is our teams work to make your stay in our Villa being unique. More than unforgettable, we will try to make you forget hotels with our staff only dedicated to you, and only you. They are no comments which can please us more on TripAdvisor than the ones about our staff. Because all our teams are doing their best at all time to please you in order to make you have an amazing trip with us in Seminyak. So, from all the Villa Chocolat team, thank you very much! Marine, this is a wonderful review, thank you very much. All the staff really appreciat when our guest value our work. This recognition encourages us to try to do always better. When a guest call us “the best” it means that our mission is accomplished… But we will keep on working to improve our guests experience. Thank you so much Danielle for your wonderful comment on TripAdvisor ! We really hope to see you again in order to try to make your stay even better. Thanks a lot for your TripAdvisor review. 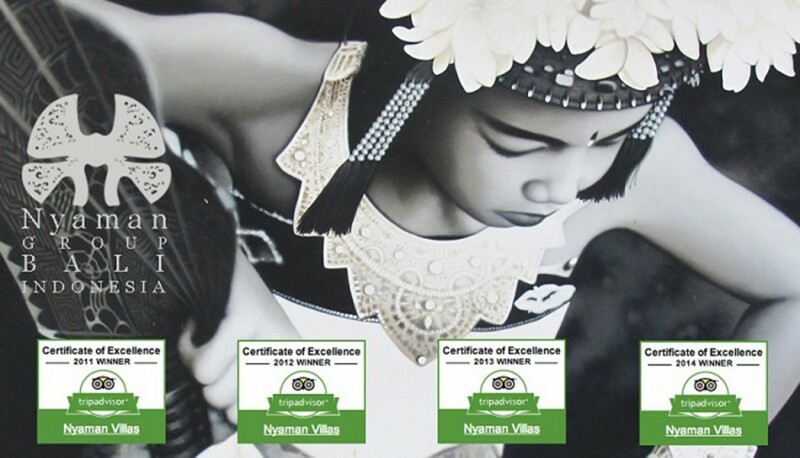 Your message means a lot for us, and because of it, we will try to make sure that all of our next customers will appreciate their stay in Villa Chocolat the way you did. Thanks a lot for your comment on TripAdvisor. Having some happy and satisfied guests is our best motivation to make our standards increase more and more. 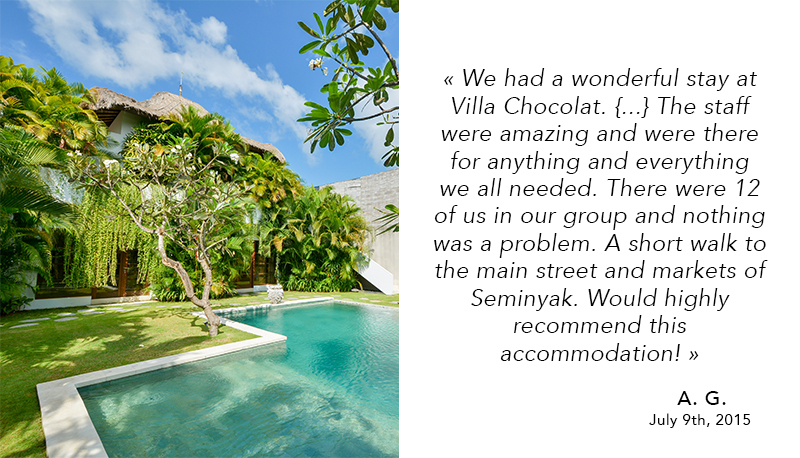 We hope to see you in our Seminyak villas again. Posted on November 23, 2015 by admin in BLOG | 1 Comment.